Every now and then a sequel is made that out does the original such as The Godfather part II, Superman II, The Empire Strikes Back, The Terminator II, The Dark Knight, and Aliens to name a few. 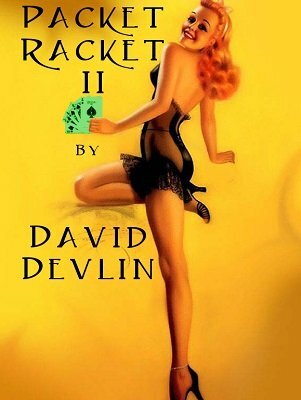 Well, such is the case here with David Devlin's Packet Racket II . If you like packet tricks (David loves them) then you will love this eBook! All six of the tricks use standard packet sleights, and only one of them uses gaffed cards. (You can find the first volume here Packet Racket ). Triumphant Travelers: What do you get when you combine Open Travelers with Triumph? You get Triumphant Travels. This one is impromptu. Ambitious Reset: This quickie is a perfect follow-up to Triumphant Travelers, and combines the Ambitious Classic plot with Paul Harris' Reset plot. This is also an impromptu routine. Inside Out: A packet of four cards changes to its exact opposite in three phases. Only four cards are used; none are gaffed. Outside In: A continuation of "Inside Out" and you are left totally clean. Guaranteed Monte: A new Monte game that uses eight cards: seven money cards and a single loser card. The spectator does not stand a chance, because all of the cards change into loser cards. Every...single...one! No gaffs, and all the cards are examinable in the end. This is the real prize of this eBook, and was going to be released as a single effect. Maxi Twisto Retwisted: This is David's reworking of the classic effect, "Maxi-Twisto" by the great Nick Trost. David's version is much cleaner, and looks like real magic. 1st edition 2017, 35 pages.